I picked up these dressers at an auction 10 years ago for $10. It was before I even knew how to properly paint furniture, but I painted them white for our Master Bedroom in our first house. 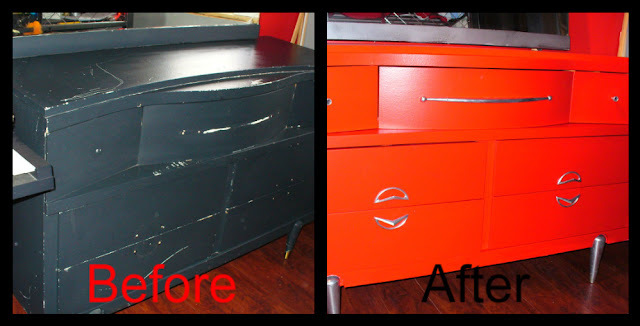 Then, I painted them black when I redesigned our master bedroom. and yucky for 5 years! 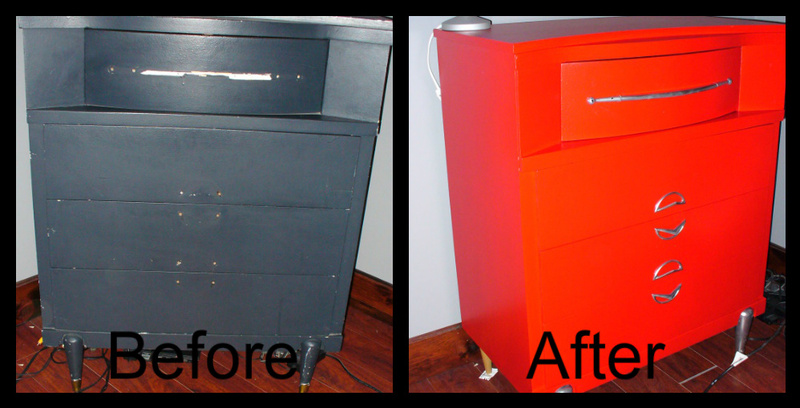 Now they are Retro Red & Chrome (spraypaint)! Love it!!!! Some really cool curves on these - You can't buy curves like that anymore! This is really red in person, not orange. Awesome job. Totally reminds me of the movie Cars. Esp the handles with the red. Watch out Lightning McQueen. :-) Great transformation. that is so smashing fun! it reminds me of a retro red car in a good way! holy, holy! what a wise woman to hold onto those dressers all these years! lovelovelove the red! I am so loving this!!! It is so hot it is smokin! 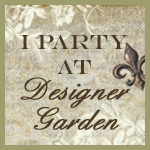 I am featuring this at my party tomorrow, thanks so much for linking up.